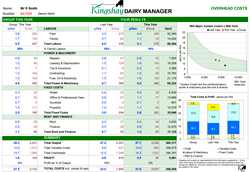 A One-off Analysis of your herd's profitability and costs of production. Reports similar to Premium Plus package, but as a stand alone package. Examples of the Package reports are shown below as well as an example of the Input Form showing typical data required. Please note: our 2 months free offer does not apply to the Profit Manager Package as this is a one off analysis. 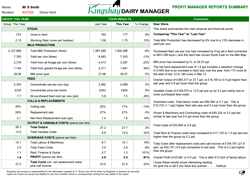 Quarterly report detailing all income and production costs for your herd. 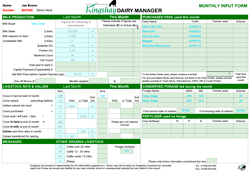 Easy to complete forms enabling comparison to other progressive herds. Shows all costs in total £, pence per litre, £ per cow or £ per hectare. Uses figures from year end accounts. Quarterly report outlining key income figures and variable cost expenditure with comparisons to the group average. 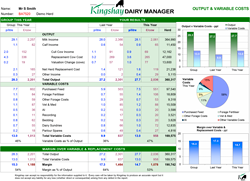 Quarterly report with overhead costs for dairy enterprise. Overhead costs for mixed farming enterprises are easily split out using our unique computer model. Family labour costs are also calculated and compared. An example of the data required to complete the Profit Manager package. We can analyse individual and group results and supply a facilitator to lead discussions on herd profitability. Results are displayed using our unique and easy to follow "Charts Program". Contact us for more details of our service for discussion groups.